Man VS the World is a free 2D arcade shooter made by 'Mikes Plumbing and Tile: Media Arts Division' which is very clearly inspired by old arcade games. You play Mann Lee Gunns, one of the most dangerous men in the world, and the world has just declared war on him. Mann must fight through the world’s forces, in three different acts/locations around the world. 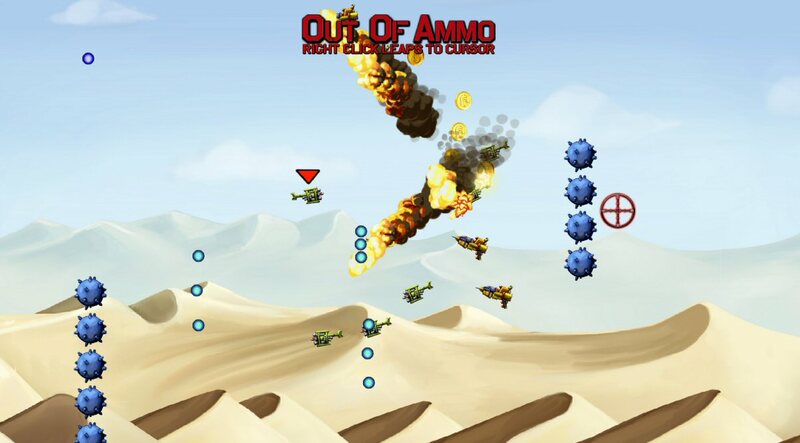 Man VS the World is your typical shoot'em up and explosive filled aircraft flying game. While this idea might not seem original and seems to be a very popular idea compared to what many others independent game developers have created, Man VS the World has a couple of different things you don't normally see. You aren't forced to stay in a single vehicle like many other games, and there's a reason for this, the aircrafts you can fly are very weak and so when a aircraft is destroyed and going to crash, you have to jump out and steal someone else's aircraft. You can do this whenever you want even if you see an aircraft you just fancy. There are also some platforming elements, similar to what you can see in Super Mario Bros. with the climbing on the wire fence, which you have to do to get through some parts of the levels. This game has the usual type of graphics that these 2D arcade inspired games have (8-bit or 16-bit graphics), which works well, and it also has its own rock music for the action scenes (which is the whole game). 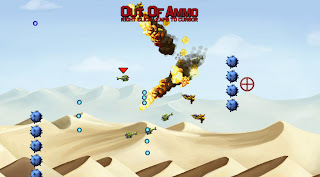 The gameplay is also very similar to these older arcade games, but with the added in elements of platforming and freedom of choosing/stealing other aircrafts. The only problem I had was the coins that you could collect. Usually when you'd see collectible coins in a game, you'd think they must count towards points or money you could spend, I was kind of disappointed by the fact that there was no score (or at least I couldn't find one). But then with that said you're just wasting your time trying to even collect them, if there is no benefit or score for the player. Overall it's a fun game, if you like the old arcade game, you'll like this, but you might be a bit disappointed by the lack of a scoring system.